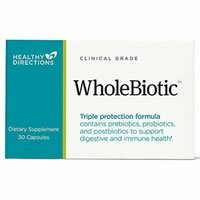 Overall, at 2 out of 5 stars, Healthy Directions WholeBiotic is a slightly below average probiotic. I want to like this probiotic more but it falls short in some major areas for me. The few things I do like about it is that you don’t have to refrigerate the capsules. They come in specially formulated blister packs that make it shelf stable and convenient to use. The product also says that it’s safe for kids 4 and older to take, which is a plus. The directions say to take 1 capsule daily before breakfast or lunch and you can take up to 2 capsules if you need additional support. It’s simple enough to take but here are the things that I don’t like about it. The biggest problem I have with WholeBiotic is that it doesn’t specify how many cells are in it. It just says, “LCR35 WholeBiotic Culture Matrix 375mg”. This doesn’t do anyone any good if you don’t know the specific cell count. By only listing the milligrams, it’s hard to tell if this is meant for daily use or for a specific ailment. This probiotic is also not allergy friendly. The capsules contain MILK, which is a huge problem for so many people. There are also added ingredients that I don’t think are necessary. The capsules contain caramel coloring, potato starch, and maltodextrin. I like when probiotics are more natural. Also, potato starch and maltodextrin could potentially upset some people’s stomachs. Overall, at 2 out of 5 stars, WholeBiotic is a slightly below average probiotic because it leaves you guessing on the cell count, isn’t allergy friendly, and uses potentially problematic added ingredients, however it’s safe for kids 4 and up, is shelf stable, and is easy to take. Healthy Directions WholeBiotic contains 375 mg of Lactobacillus rhamnosus. There is no specific cell count, which is an absolute bummer. All the company gives you is a milligram amount that’s not helpful at all. I do like the use of Lactobacillus rhamnosus in the strain profile. This strain has been shown to help balance out the bacteria levels in the body and supports the “friendly” bacteria. Lactobacillus rhamnosus may also help alleviate diarrhea when taking antibiotics or when traveling to other countries, often known as traveler’s diarrhea. Other potential benefits of this strain, however not extensively researched yet, are potential help with Crohn’s Disease, vaginal yeast infections, and lactose intolerance. WholeBiotic does contain a prebiotic in the form of fructooligosaccharides (FOS), which is good because it helps feed the probiotic. If you’re allergic to milk or have sensitivity to it, don’t take this probiotic. The other ingredients included are: Fructooligosaccharides, potato starch, hydroxypropyl methylcellulose, ascorbic acid, lactose, maltodextrin, magnesium stearate, and caramel (color). For 30 capsules lasting 1 month, it costs $14.99. This works out to be $0.49 a day to take this probiotic. This price range is right at the average range for a daily probiotic. I’m not a huge fan of this product, so I think there’s better value out there for your money. I didn’t experience any side effects while taking WholeBiotic. I was happy to see no belly pain or cramps. However, if you’re allergic to milk be sure to steer clear of this product. Healthy Directions WholeBiotic has a 100% money back guarantee. You have 90 days to try their product and if you aren’t satisfied then you can get your money back. I’m happy to see that this product has a satisfaction guarantee. To buy Healthy Directions WholeBiotic, click here. Allergy Concerns The capsules contain milk in the form of lactose. Side Effects I didn’t experience any side effects while taking this probiotic.